Saute garlic, ginger, onion and chicken in the order given. Cook till half-done, add enough water to cook chicken until tender but not overdone. Add papaya pieces and cook until soft but not mushy. 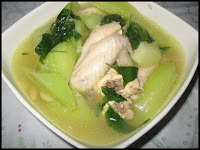 Add patis and sili leaves 5 minutes before serving. You can substitute papaya with upo or sayote. Instead of sili leaves, use spinach or other green tops. yummy josie! that looks really great. Hummm.......so delicious especially you use native chicken...so good. oh mama mia...nakakatakam....been a long time na din akong d nakakatikim nito...d kasi fresh mga manok dito...ehehehe!